Four Professors from Hiroshima University received an Acknowledgement for Excellent Reviewers of the Screening Committee for JSPS Research Fellowship for Young Researchers and the International Collaborations Committee for the FY 2017. This award has been given to the excellent reviewers who provided significant input into the screening process to develop the Japan Society for the Promotion of Science (JSPS) Programs of the International Collaborations and Research Fellowship for Young Scientists. In Fiscal Year 2017, of the approximately 1,400 reviewers who participated in the screening process, 600 who were serving the second year of their terms were eligible for the aforementioned award. Among them, 137 reviewers became the award winners. 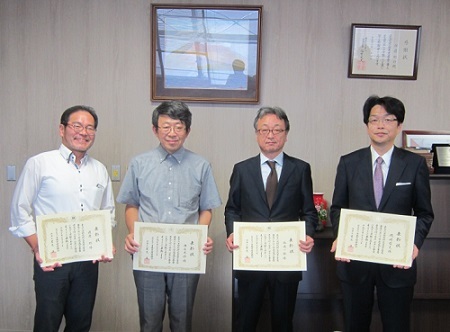 The four professors who won the award received a certificate of recognition from Executive and Vice President (Research) Yohsuke YAMAMOTO.